Our service department staffs experienced, skilled technicians. 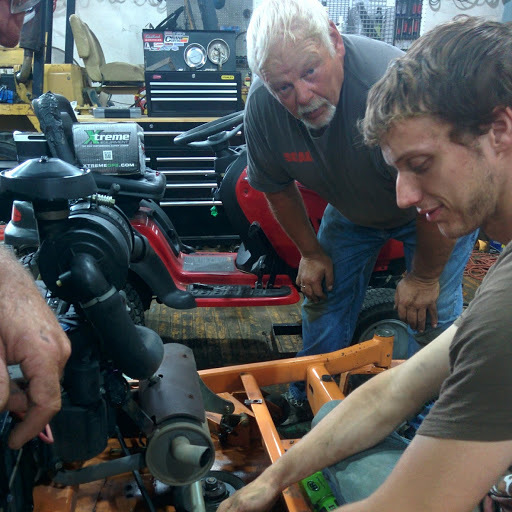 We service almost every brand of lawn equipment and small engines, as well as sharpening chains and mower blades. Our technicians are certified and updated annually. The following is a description of our maintenance package. Some items may not be appropriate for all mowers. Change engine oil & filter. Change air filter & pre-air filter. Change spark plugs. Change fuel filter. Clean engine cooling fins. Clean mower deck. Check mower deck belts, bearings & idlers. Sharpen & balance mower blades. Check transmission belt & idlers. Lube all grease fittings. Check tire pressures. Level mower deck. Check charging system and load tested battery. Set engine RPM’s. Check for proper operation. Wash machine. We always put the customer first. That’s reflected by the simple fact that we value your time and money. We’re always performing engine checkups and repairs in a timely and cost-efficient manner! When new equipment purchased at Mower Doctor comes into the Service Dept by its original owner, it will receive priority status in line and 10% off parts and labor. Quite a savings on time and money. By now we have repaired thousands of lawn mowers. During the last decade we garnered hundreds of loyal, returning customers all thanks to the quality of the work and repair we provide. Our masters are good at working with any kind of lawn mower damage, repair and replacements and the price is always kept leveled and balanced!